Where to Place your Piano? Whenever you buy a piece of furniture, the first thing that comes to mind is where you’re going to place it your home. Well, the same goes for a new piano too. If you want it to be able to stand the test of time, you’ll need to know the right conditions and areas to avoid placing it. Firstly, it is critical to find a location where the temperature is constant. Pianos do not function well with constant changes in the atmosphere. Thankfully, Singapore doesn’t have winter, hence it gives you more available options. Therefore, avoid placing your piano in an air-conditioned room. The living room would be a better choice instead. Secondly, some sunshine is good but too much of something is never good. Never place your piano under direct sunlight as it would cause the wood to fade. Apart from that, sunlight can cause your piano to become out of tune. Hence, it is strongly recommended to keep your pianos away from windows that allow direct sunlight in. Thirdly, avoid placing your piano near the kitchen area. It is an extremely bad idea to place your piano next to an open kitchen. The reason is because that the steam from cooking can get absorbed by the wood. This causes humidity, which can post problems for your piano and even lead to rusting of the tuning pins and strings. Lastly, it would be ideal to keep your piano away from windows, doors and air-condition units. These are places where cold air can come into contact with your piano. When that occurs, you’ll realise that your piano keys will start sticking, dampers will stop working and other problems that will hinder your piano’s performance. So after these few pointers, where is the ideal place to put your piano at home? The living or dining room! These places tend to have constant temperature if there isn’t any air-condition unit. What should your room layout and design be like? Hard-wood floors are the best because of their stability. Also, it would be better if you can place a rug underneath your piano. This will provide some protection against the heat from your floors. 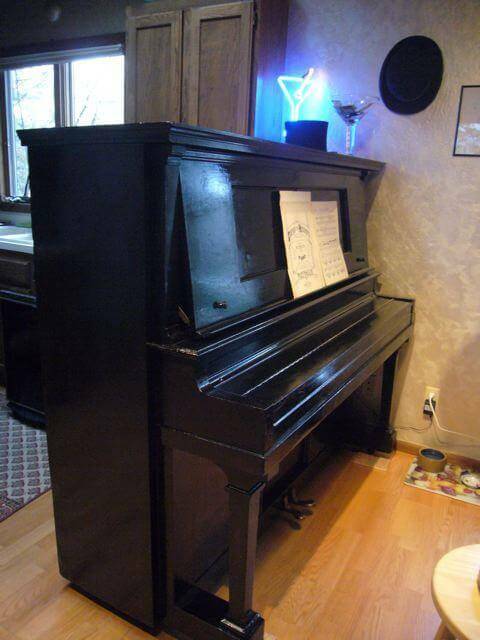 With all these in mind, you should be able to find a good spot in your house to place your piano. Having a hard time choosing a suitable piano? Why not take a look at the guidelines on our website? We offer pianos for rental and sale. Apart from that, do take a look at our various piano lessons available.